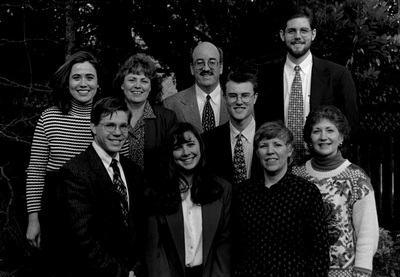 1995-1996 George Fox College Admissions Staff, (front row, from left) Kevin Dougherty, admissions counselor, Michelle Brown, admissions counselor, Shari Bowman, administrative assistant, and Kay Lynn Koskela, records manager. (middle row) Jennifer Swanborough, admissions associate, Mary Austin, secretary, graduate and undergraduate admissions, and Matt Clemons, admissions counselor. (back row) Jeff Rickey, director of admissions and Ron Wolfe, admissions counselor. December 1995.